I wrote to Tom Woodard on facebook, not knowing he Joined Florida Legal and this is my first time on this site as well. First off, my partner and I have been together for 5 great years, and I did not come out to my family until April 15 of 2010, and still closeted to co- workers and some friends. The other night we were on adam 4 adam...we stress on the site looking for friends only and that is it.. But while on the site, I noticed a co- worker on the site, who is out and everyone at work knows about him. He is a real nice guy, but loves to gossip, I am 99% sure he saw us on the site, but neither of us messaged him. Where we work in Palm County, the prison is 90% black officers and 90% black inmates, not that it matters because neither are racist, but we would be the only 2 gay white officers and think we would be over looked for advancement. There are alot of gay and lesbians were we work and most are good officers, yet they still get mocked by officers and the inmates. My fear is being outed at work and being that it took my 43 years to come out to my family, I don't know how I will handle when and if we get outed, gossip travels fast and if one knows the whole compound will know including the inmates. I am very proud of my partner and I, but honestly if confronted by staff I really don't know how I will react to them or even the inmates. We are both good officers, fair firm and consistant, and treat all with due respect. Is there a correct way to respond to co workers and if this becomes a hostile work environment how do we handle that. You may seem I am overreacting which I probably am, I just want to be mentally prepaired. There is alot of gay bashing at our facility and we both love our job and are good at it, but neither of us are going to be bashed or intaminated and just looking for any advice and guidance. We are new members and didn't know where to start and looking forward to meeting everyone at future events. Hey infireplug. I sent you a personal message. Aside from the possible local and state resources that would likely assist both of you in case there becomes an issue over your sexuality in the workplace. I think it is important to note that many of us have experienced a “hostile” or harassing environment at varying degrees. This includes after being “out” and comfortable in our own skin. Unfortunately, I had to experience a really dark side to this topic on my department. 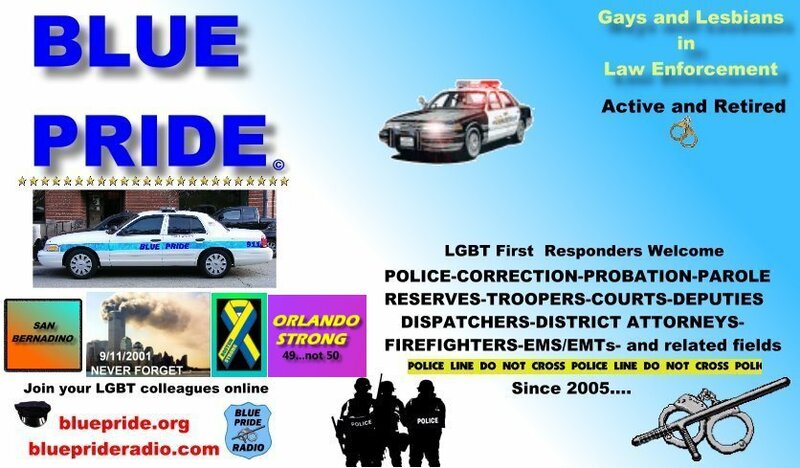 In fact, I still am the only openly gay male officer on my department and proudly say so! I depended on those officers who supported me (as well as family) to get through the bad days. No, not a pity party to feel sorry for me because I may have felt depressed or angry because I wanted to bash some morons head in for being so ignorant. Just support in knowing that regardless of negativity, I did my job and probably better than those; who were so willing to think they had a right to harass anyone because they were different. Many times I have taken the high road (though I wish I didn’t), it still has paid off for me in the end. Just thought I would share my brief thoughts on the subject.